The battle between 2AM Im Seulong and 2PM's Taecyeon has been a miss fire. 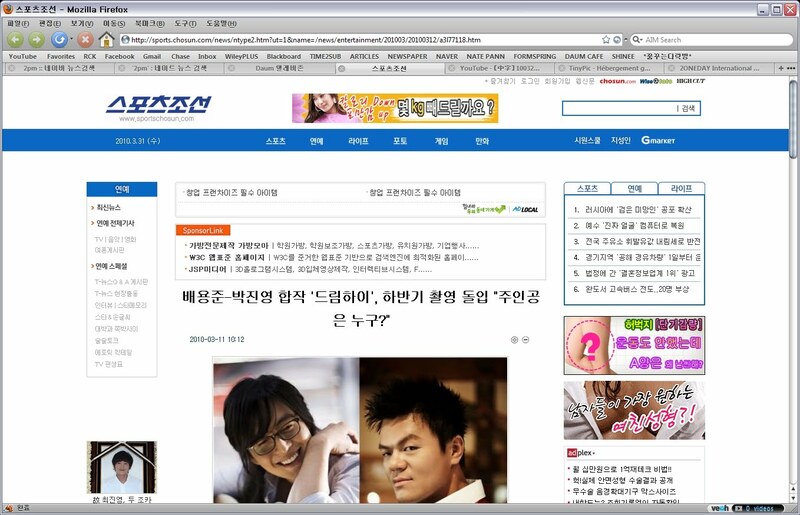 On March 31st, MBC's 'Personal Taste' and KBS 2TV's 'Cinderella Sister' were broadcast at the same time. 'Emotional Idol' Im Seulong and 'Beastly Idol' Taecyeon made their acting debuts, receiving much attention over the battle. Unfortunately, the first 'Cinderella Sister' episode that was aired featured Taecyeon's child version, Moon Sukhwan. Taecyeon's child version was already known to be featured in the drama, and when it was first released that Taecyeon would be transforming into a chubby male, his agency was quick to clarify, "It's not Taecyeon but his child version that will be chubby." After the child actor has done his part, the anticipation for Taecyeon's role is expected to increase. 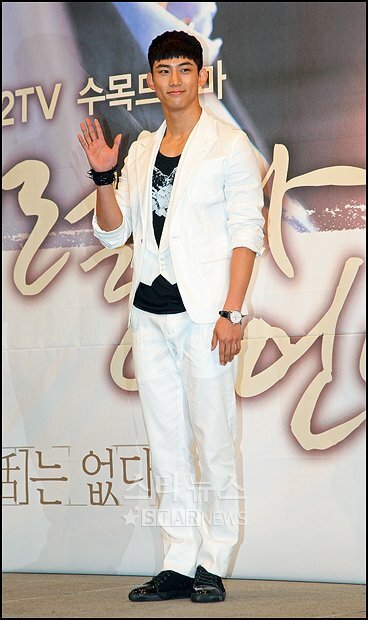 On the contrary, Im Seulong made a successful acting debut on the first episode of 'Personal Taste.' Playing the role of Jun Jinho's college junior, Im Seulong naturally carried out his drunken character and was able to give more meaning to the scene. Fans have given their opinions, stating, "The image he showed is 100% synchronized with what he shows us on the reality program," and "It was really funny." The two dramas have finally unveiled themselves, but Moon Geunyoung's edgy transformation has given 'Cinderella Sister' a 3% lead in viewer ratings. May be taken out with full credits. You are not allowed add yourself to the credits nor edit the credits. Which star is most likely to be fooled on April fools' day? Music portal site bugs.co.kr held a poll that asked which star would most likely to be fooled on April fools' day, held from March 22nd to the 29th. A total of 3,117 participated in the poll. SNSD's Sunny won by 32.15%. Second place was Nichkhun by 31.5%, a small margin. Participants picked him because they thought that he would not be able to completely understand the Korean spoken to him, thus, making him easier to fool. Third place was 2AM's maknae, Jinwoon. Jinwoon may be 2AM's maknae but has outstanding vocal talent and producing experience, receiving much attention. Netizens have stated, "Jinwoon is amazing but he looks like he'd be easy to fool," "Jinwoon laughs so innocently, he may be fooled like a child!" Fourth place was Kara's Kang Jiyoung, 5th place was f(x)'s Krystal, and 6th place was Beast's Yoon Doojoon. 'Cinderella Sister' has taken first place in viewer ratings for the week. AGB Nealson Media Research's survey shows that Cinderella Sister had a 15.8% viewer rating, taking first place. MBC's 'Personal Taste' and SBS's 'Prosecutor Princess,' both of which aired at the same time as 'Cinderella Sister,' recorded 12.% and 8% respectively. 'Cinderella Sister' features Moon Geunyoung in her first role as an antagonist and has been receiving much anticipation from the viewers. It's based on the story of Cinderella and develops the plot of a cinderella being pushed around by a step mother and sister, in which she later takes revenge against the step sister. It is also Chun Jungmyung's first project after his military service and 2PM Taecyeon's debut as an actor. Son Yejin and Lee Minho's 'Personal Taste' is a romantic comedy of the hapenings between an awkward girl, Park Gaein, and a fake gay, Jun Jinho. 'Prosecutor Princess' features Iris's Kim Soyeon as a luxury brand-aholic prosecutor. 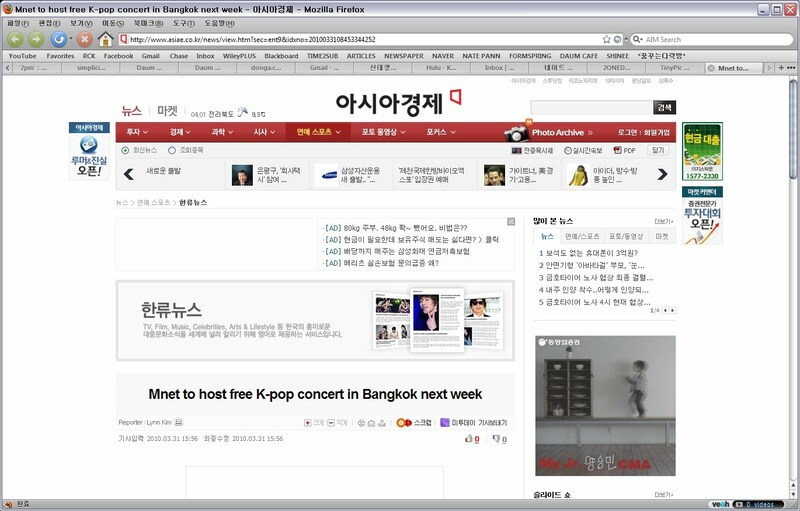 Cable music channel Mnet will be hosting a free concert in Thailand next week starring over a dozen K-pop groups, according to a press release by the broadcaster on Thursday. Mnet announced it will hold the "ShowKing M in Bangkok" at 7 p.m. on April 6 where a total of 18 different artists, including 2AM, Brown Eyed Girls, Choshinsung, CNBLUE, Kara, Kim Tae-woo, MBLAQ, SG Wannabe, Son Ho-young, T-ara and U-Kiss, have been set to perform. 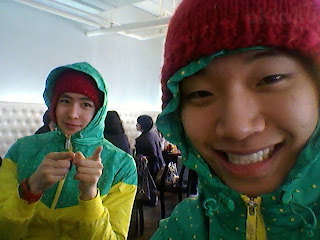 Boy band 2PM members Junsu and Wooyoung have been chosen as emcees for the event. "Thailand is currently the advance guard for spreading Korean pop music," said the show's chief producer Kim Dong-joon. "Many Korean singers will be able to promote themsevles overseas from this performance and largely contribute in raising the popularity of the local pop music, the Korean Wave." Korean music industry officials also explained that there are many Korean singers who will "take advantage of such big, local music show to break into overseas markets." The free concert, which will take place at Thailand's Rajamangala National Stadium, was organized by media business company AMADAS and will be broadcast jointly by Thai terrestrial network MCOT and Korea's Mnet. 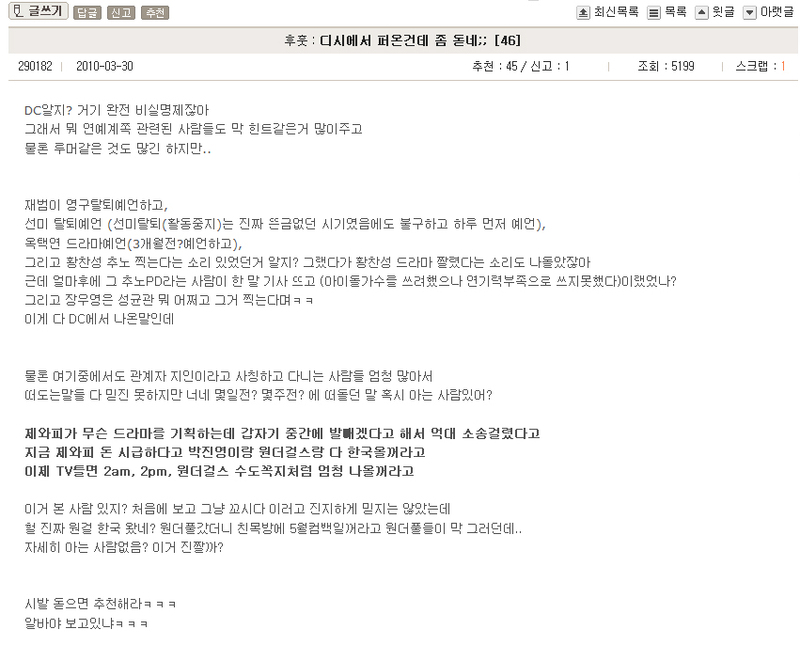 A press conference regarding the show will be held April 5 with the concert itself set to air on Mnet two weeks later. Before you read this comic, there are some things that need to be pointed out. Jaebum made spelling errors in his Korean part of his message. 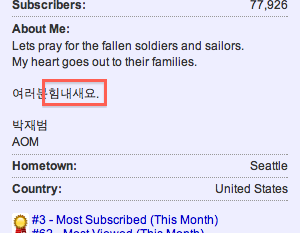 - 'Stay strong' in Korean is spelt 힘내세요 or Himnaeseyo. 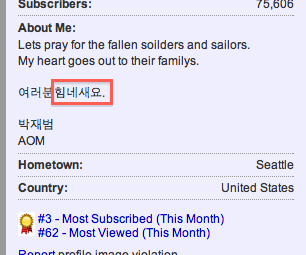 - In his original, unedited message, it read 힘네세요 - Himnesaeyo. 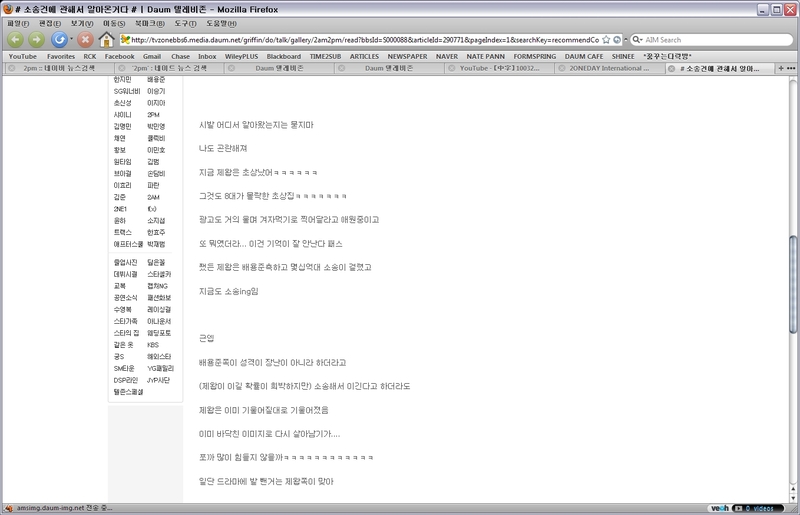 - In his edited version, it reads 힘내새요 - Himnaesaeyo. 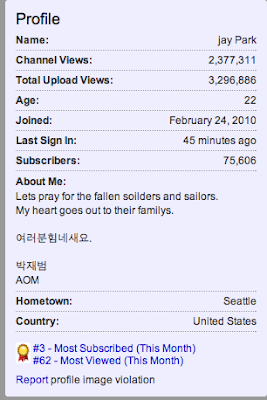 His edited message is still the wrong spelling, lol. I totally forgot about this picture. The iPhone's picture quality is really good. [스포츠조선 T―뉴스 이인경 기자] 배용준과 박진영이 손을 잡은 드라마 '드림하이'가 올 하반기 본격적인 촬영을 앞두고 있어 주인공이 누가 될지에 관심이 쏠리고 있다. 한 관계자는 "최근 시놉시스와 대본 초고가 나왔다. 기존 학원물과 차별화된 다이내믹한 스토리가 반영돼 좋은 반응을 얻을 것으로 기대한다. 올 하반기 촬영에 돌입하기 위해 현재 준비에 박차를 가하고 있으며, 주연급 배우들의 캐스팅도 논의 중"이라고 전했다. '드림하이'는 배용준의 소속사인 키이스트와 박진영의 기획사인 JYP엔터테인먼트가 공동으로 제작하는 첫 드라마다. 끼넘치는 예술고 학생들의 방황과 우정을 그린 학원물이 될 전망. 올 상반기 방송을 목표로 지난 1월 드라마 제작을 위한 공동 계약을 체결했으나, 진행이 다소 미뤄졌다. 최근 시놉시스가 나오고 하반기 촬영을 가시화하면서 주연급 논의도 물살을 탈 것으로 보인다. 예상대로 이번 드라마에는 키이스트와 JYP 소속 연예인들이 주인공으로 대거 나설 계획이다. 키이스트에는 '리틀 고수' 김수현과 '거침없이 하이킥'의 나혜미, 유설아 등 많은 신예가 포진돼 있으며 JYP엔터테인먼트에는 2PM을 비롯해 원더걸스, 2AM, 주 등 아이돌 스타들이 많다. 특히 2AM의 슬옹과 2PM의 택연이 드라마 '개인의 취향'과 '신데렐라 언니' 등으로 연기 겸업에 나서 좋은 평가를 받는다면 아이돌의 드라마 참여는 더욱 확정적이다. 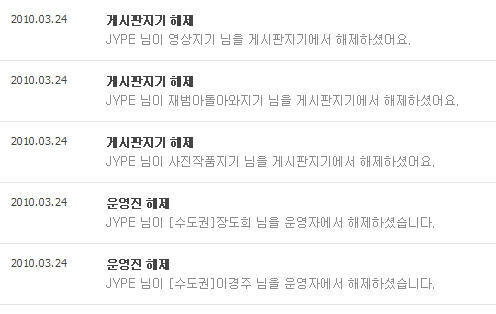 하지만 2PM 재범 탈퇴 사건과 맞물려 JYP의 연기 진출에 곱지 않은 시선을 보내는 팬들도 있다. JPY 측은 "드라마와 관련해서 아직 정해진 바는 없다"며 말을 아꼈다. Bae Yongjun and Park Jinyoung's joint drama, 'Dream High,' is set to begin filming in the second half of the year, creating attention as to who will be chosen as the main casts. An associate stated, "The synopsis and script draft have been completed. It's a dynamic story with an in school setting. There's a lot of anticipation for good reviews. We are currently preparing to begin filming in the second half of the year. We're in discussion with a variety of actors for casting plans." 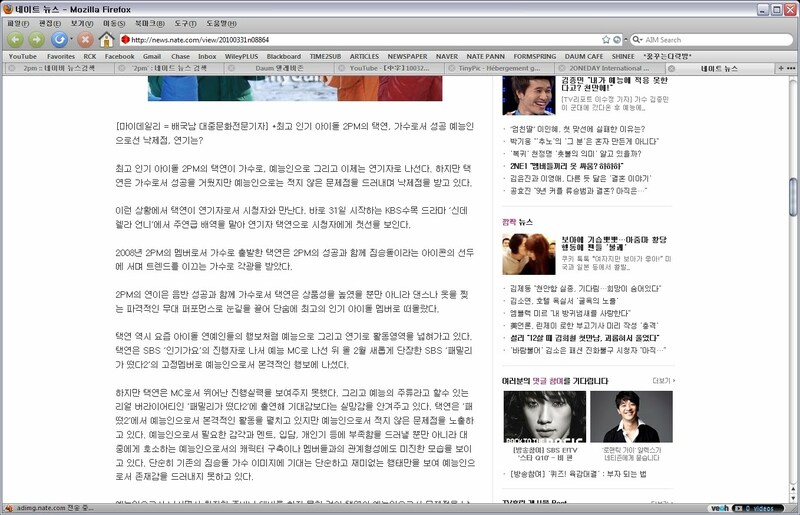 'Dream High' is a joint project between Bae Yongjun's agency, KeyEast, and Park Jinyoung's agency, JYP Entertainment. The story is set in a talented arts high school, where the main plot revolves around the rebellions and friendships of the students attending it. The contract was originally signed last January in order to begin filming in the first half of this year, but the progress has been significantly delayed. With the recent release of the synopsis and articles being released on plans of recording dates and cast offers, it seems as if this drama will feature celebrities from both KeyEast and JYP Entertainment. KeyEast is the agency to many rookie stars such as Kim Suhyun, Na Hyemi, and Yoo Seora while JYP Entertainment houses idol stars such as 2PM, 2AM, the Wonder Girls, and etc. If 2AM's Seulong and 2PM's Taecyeon are able to receive great reviews from their acting debuts in 'A Personal Taste' and 'Cinderella Sister,' their casting into this drama is more than definite. 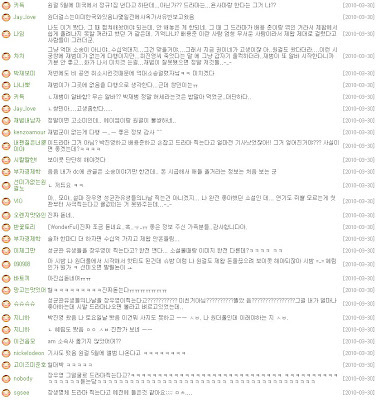 However, because of the 2PM Jaebum controversy, fans are sending negative views about the casting to the company. An associate of JYPE stated, "It has nothing to do with the drama, and there is nothing decided yet." This article is from March 11th. Translated for those curious in light of the recent rumors. Taecyeon: top singer, rookie variety star, what about his acting? [MyDaily = Bae Kuknam, Mass Culture Special Journalist] 2PM’s Taecyeon, a singer with the greatest popularity but rejected as a variety star. What about his acting? 2PM’s Taecyeon is moving forward as a singer, a variety star, and an actor. Even though Taecyeon may have been met with success as a singer, he is receiving heated rejections regarding his role as a variety star. Despite the situation, he will be meeting the viewers as an actor. Set to air on the 31st, KBS’s newest drama, Cinderella Sister, has cast Taecyeon as one of their lead actors, showing Taecyeon’s first steps in his new career. From 2008, Taecyeon began as a member of 2PM and was met with considerable success, becoming the representative icon of the beastly idol image. Their albums had great sales, furthering Taecyeon’s worth, and his scandalous shirt ripping performances on stage has put him in the position of the best idol of today’s market. Like many other idols his age, he has also set foot in the world of variety shows, expanding his career opportunities. Taecyeon began with MC’ing for SBS’s Inkigayo and joined SBS’s Family Outing 2 as a fixed cast member, officially starting his variety activities. The reason for such blatant exposures of problems is Taecyeon’s fault for not properly setting up the foundations needed to enter the world of variety shows. 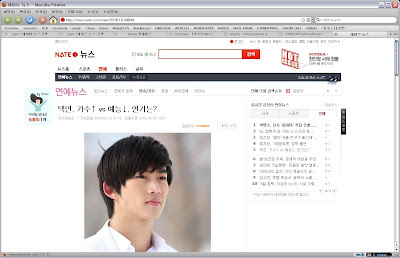 Taecyeon is now going into acting. Since 1990, the pattern of singers turning into actors have grounded itself into the general system. When the career lives of idol singers have run their last breath, they turn to acting to further their careers, causing an influx of singer turned actors in today’s market. 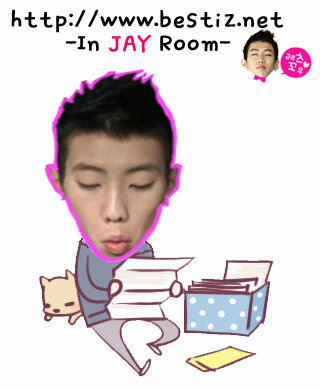 Taecyeon has already exposed a problem. Will he able to succeed as an actor? Cinderella Sister will be an important milestone in his career. Should he show a weak talent in this area, it will inevitably give a negative impact to his career as a singer. Taecyeon will be starring in Cinderella Sister as a rough character that falls in love with the only woman that has ever cooked for him. Because of his love for her, he turns 180 degrees into a handsome, successful young man as Han Jungwoo. He will also be starring with Moon Geunyoung, Chun Jungmyung, and Seo Woo. Although he has succeeded as a singer and has been met with disappointment as a variety star, what kind of result will he show us with his acting? It’s all fake. He comes out on Win Win and complains about struggling because of the rumors regarding him and Yoona, but he’s the one that said rumors disappear regarding Jaebum. He’s not even that amazing of a singer. What kind of a singer goes and lashes out his fans criticizing his singing? He sarcastically replied to them saying that he’s a rapper, but thanks for telling him to practice singing anyway? I’m just going to watch the drama with Kim Soyeon in it. Sorry to Moon Geunyoung and Chun Jungmyung! - I'm just going to watch the drama with Lee Minho and Son Yejin. - Of course, his rumor, he's suffering.. but his friend's rumor, he doesn't care since it disappears, right? Just send his character to study overseas around the 3rd or 4th episode so I can just watch the drama in peace. - The PD will probably just kill him off anyway. Isn't there a car crash in the script? His career as a singer is now fckin fail. His variety show was already fckin fail. Now his acting drama will be fckin fail. - Wow, you're a better rapper than Ok Taecyeon, you should become a rapper too! - Your rhyme is better than Taecyeon. 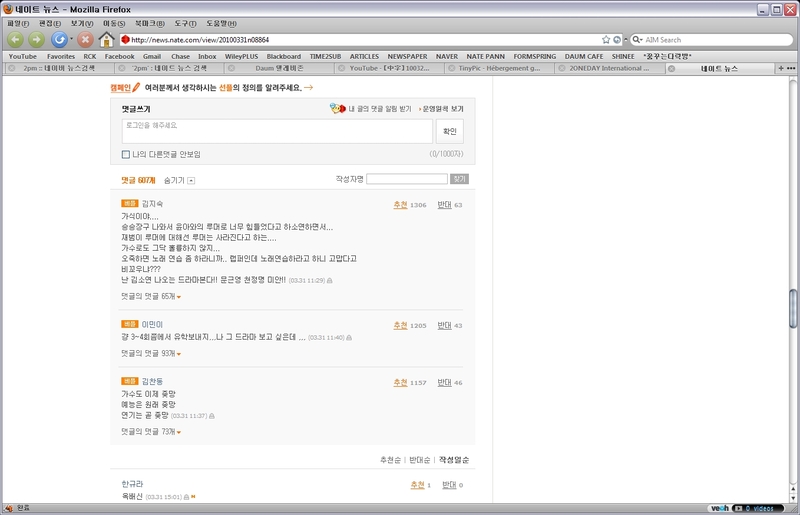 - Taecyeon, you should learn to rap at least as good as this netizen. well, in their variety shows before only one person stands out as a humorous one, no need to mention his name right??? Alright i will say his name,, it's.......... JAY PARK!!!!!! 물론 루머같은 것도 많긴 하지만..
근데 얼마후에 그 추노PD라는 사람이 한 말 기사 뜨고 (아이돌가수를 쓰려했으나 연기력부족으로 쓰지못했다)이랬었나? 떠도는말들 다 믿진 못하지만 너네 몇일전? 몇주전? 에 떠돌던 말 혹시 아는 사람있어? 헐 진짜 원걸 한국 왔네? 원더풀갔더니 친목방에 5월컴백일꺼라고 원더풀들이 막 그러던데..
자세히 아는 사람없음? 이거 진짤까? Anyway, right now JYPE is in a lawsuit with Bae Yong Joon's side for hundreds of thousands of million dollars. At this moment, too, they're lawsuit-ing. You guys know DC, right? (TN: DC 2PM Gallery) A lot of the people associated and involved with the entertainment industry drop a lot of hints and rumors there. They're the ones that predicted Jaebum's compelte withdrawal. They predicted Sunmi's withdrawal the day before the official announcement. They predicted Ok Taecyeon's drama three months before the announcement. And they also said Hwang Chansung was lined up to cast for Chuno, right? Afterwards, there were rumors saying that he got cut from the drama. Then, a bit later, the Chuno PD released an article saying that he attempted to use an idol singer but because of his lack of acting talent, he wasn't able to. Wooyoung is also set to film a drama called Sungkyunkwan. Of course, there are a lot of people that claim to be entertainment associates so it's impossible to believe all of the rumors but this is the latest one circulating since a couple days ago. "JYPE went into contract for a drama but pulled out in the middle so they're getting sued, estimated in hundred millions. JYPE is tight on cash and so he's bringing all WG to Korea. Now, when you turn on the TV, all you're going to be seeing is 2AM, 2PM, and Wonder Girls." When I first read this, I just thought that it was nice but didn't put much thought to it. But now, what do we hear? Wonderfuls revealed the comeback date of Wonder Girls to be May. - I saw this too. The drama was with Bae Yongjun so JYPE really didn't have a chance of pulling out but they did. A lot of people are saying that JYPE is screwed because of the power Bae Yongjun has. - It's not hundred million, it's hundreds of thousands of millions. - JYPE was sued last time because of canceling Bi's concert. - There were articles before saying JYP was shooting a drama with Bae Yongjun. Is that the one that was canceled? - Honestly, would JYPE as a company get shaken by just hundreds of millions? 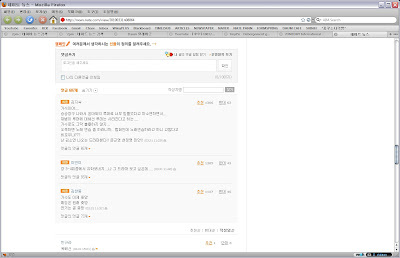 - Yes, there are articles saying Wonder Girls comeback is in May. And I saw Yubin and Park Jinyoung on saturday. - Yubin came home on the 27th, and Hyerim and Yeeun came home on the 28th. May be taken out with full credits. There should not be any removal or addition to the credits. 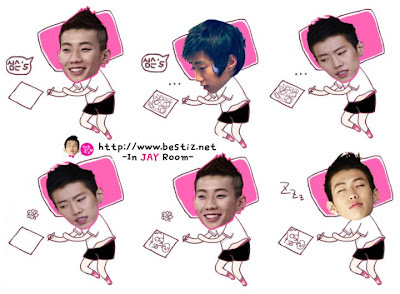 Want to join us and be a Jay Park and 2pm updater? Share your updates to our 1000+ readers. 2. After you fill up the above details, we will message you directly via email. We reported earlier that idol groups would be coming together for a concert on April 10th to show support for the South Korean soccer team at this summer’s Fifa World Cup 2010 in South Africa. But that won’t be happening now. It was announced on the 30th that due to the naval ship tragedy, the event would be inappropriate and thus they have decided to cancel the concert. The concert organizers had invited idol groups like 2PM, 2AM, 2NE1, Brown Eyed Girls, T-ara and Beast together with celebrity soccer team Super Stars’ Yoo Oh Sung, Red Devils to party together with 40,000 fans. 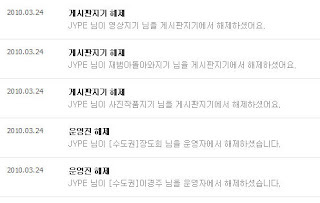 These are screencaps of the logs of the notifications/announcements of the admin terminations from the official 2PM fanclub, Hottest. JYPE has terminated [Vice President] Jung Jiyoon from the admin position. JYPE has terminated 2PM level coordinator from the admin position. JYPE has terminated the video coordinator from the staff position. JYPE has terminated the 'Jaebum Return' coordinator from the staff position. JYPE has terminated the photo coordinator from the staff position. JYPE has terminated the [Capital Area Director] Jang Dohee from the admin position. JYPE has terminated the [Capital Area Director] Lee Kyungju from the admin position. JYPE has terminated the relationship coordinator from the board staff position. JYPE has terminated the account and monitor coordinator from the board staff position. JYPE has terminated the UFO coordinator from the board staff position. JYPE has terminated the plating coordinator from the board staff position. JYPE has terminated the event coordinator from the board staff position. NOTE: In the history of idol fanclubs, no other company has ever done this before. These were the admins that remained in their positions despite the other admins resigning after the conference. All admins were terminated and the main page image of the fanclub was changed to an image of the six members, http://cafe.daum.net/2PM. On KBS 2TV's special of 'Cinderella Sister' aired on the 30th, the show revealed the lively filming set for the drama. What stood out the most was Seo Woo and Taecyeon fooling around. Chun Jungmyung jokingly stated, "They were exchanging phone numbers with one another," causing Seo Woo to become surprised. 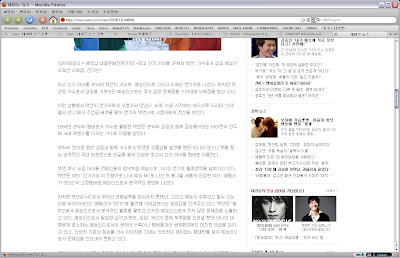 Chun Jungmyung continued his explosive statements, saying, "Seo Woo is the only one that didn't get Taecyeon's number. She kept asking me to give her his number just once." Seo Woo gave off a surprised expression with shocked bunny eyes and denied the statement. Chun Jungmyung went on to state, "So I told her that I'll give her the chance to receive his number. She's just being shy right now." Since it's a filming set with many actors close to each other's ages, the set seems friendly and filled with laughter. Chun Jungmyung revealed, "The set is always bright and full of life," showing off the teamwork between the cast. If Ok Taecyeon and Seo Woo really went out.... it's the birth of a new nuisance couple! Of course, the two most alike are the ones that hang out with each other. For KBS 2TV's newest drama, 'Cinderella Sister,' 2PM Taecyeon described his change from a singer to an actor as, "My character's a bit innocent but still has that beastly flair. 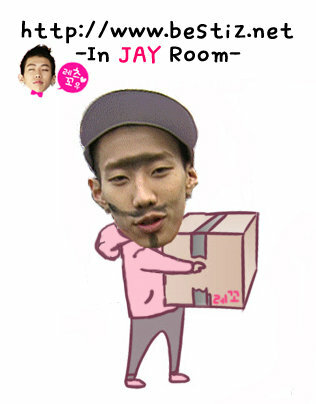 Please anticipate it." On the 30th, KBS 2TV aired the lively filming set for Cinderella Sister, interviewing the four cast members of Moon Geunyoung, Chun Jungmyung, Seo Woo, and Taecyeon. 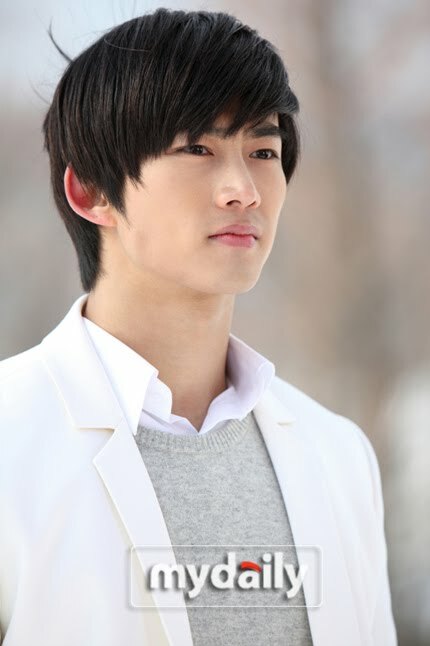 The noble and pure character of Jungwoo is played by Taecyeon. In his interview, he stated, "I'm very nervous but also excited. I've changed from a beastly man to an innocent man but the character is still able to retain both images." The younger character of Jungwoo was also revealed on the broadcast to be child actor Yoon Sukhyun. 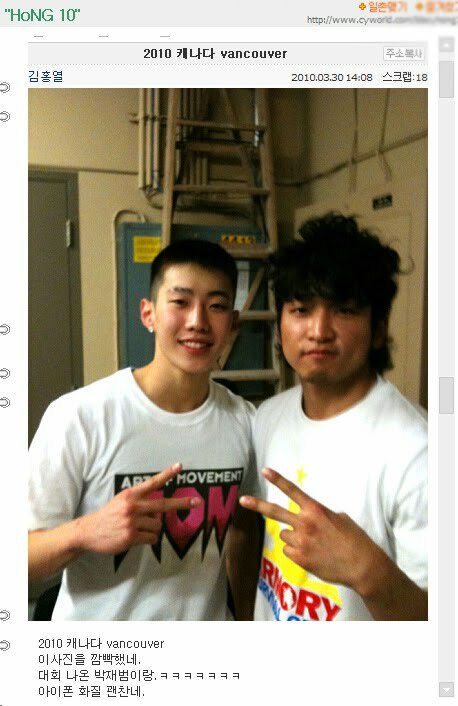 In contrast to Taecyeon showing off his muscley body, Yoon Sukhyun is on the chubby side. He stated, "I saw on the internet that Taecyeon hyung was fat when he was younger, too," giving great laughter to the film set. On the other hand, Moon Geunyoung, playing the character of Eunjo, described the tension between the characters of Chun Jungmyung and Taecyeon as, "I'm very relaxed and composed. Instead of as rivals, we'll show a better image of mutual understanding." In Chun Jungmyung's first fan meeting after his mandatory military service, he had danced to 2PM's Again & Again. "They're a group that I used to like in their debut. Being able to do a drama with him is great." He expressed his satisfaction at working with Taecyeon as actors. Would you just give it a rest already, your image is already down the drain. The only idol group without any fans, #1. The only celebrity that's suffering from a disease that makes them think they're an actual celebrity, #1. Chun Jungmyung's sense kekeke "I used to like the group 2PM..."
I used to, too... But now....????? Nice in the front, talking shet in the back. Yup, that kind of 'retaining both' image? I used this place starting from one year ago, and they now made a gallery for the citizen Jaebum? After doing my academy assignment, I couldn't sleep so I decided to come here (to the gallery). Edmonds but because my uncle lives here, I live here at Edmonds too. But I realized that I left my camera at home and drove back to my house. And he looked somewhat familiar to me, so I kept observing him. When I looked closely, I realized he was Jaebum. I was really surprised, grabbed my notebook and black felt pen out of my hand bag and went to Jaebum. I said that my name was Yu mi, and he wrote it in English, not Korean.. It's not You mi but Yu mi, but he wrote it as you.. But Jaebum was wearing really thin clothes..
Is when he double-coated the part where it was too squiggly. And Jaebum went away really quickly right after signing..
Said that "Since you came from Korea, you know who Jay is, right? Did you see the video? 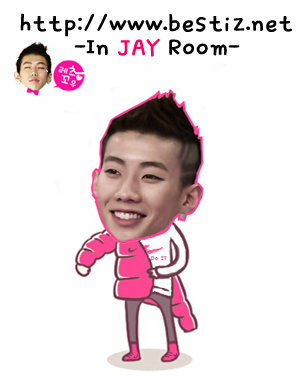 Jay was really cool"! 2PM 우영이 장혁에게 절권도로 꼼짝 없이 당했다. 최근 KBS 2TV '승승장구' 녹화에 출연한 장혁은 다부진 몸과 수준급의 절권도 실력을 선보이며 출연자들에게 쉽게 배울 수 있는 절권도 기술을 전수했다. 이날 녹화에서 절권도 실력을 뽐내던 장혁은 MC 우영에게 기초적인 절권도 동작을 가르쳤다. 절권도를 처음 접한 MC 우영은 수준급의 실력을 가진 장혁에게 꼼짝 없이 당해 주변을 웃겼다는 후문이다. 한편 장혁은 '추노' 출연을 위해 영화 '300'을 연상케 하는 강철같은 근육질 몸을 만든 뒷 얘기를 공개하며 식스팩을 공개, 스튜디오의 여성 출연자들 마음을 설레게 했다고. 2PM Wooyoung has lost to Jang Hyuk in a battle of martial arts. In a recent recording of KBS 2TV's 'Win Win,' Jang Hyuk taught the viewers a bit of the martial arts displayed in Chuno. 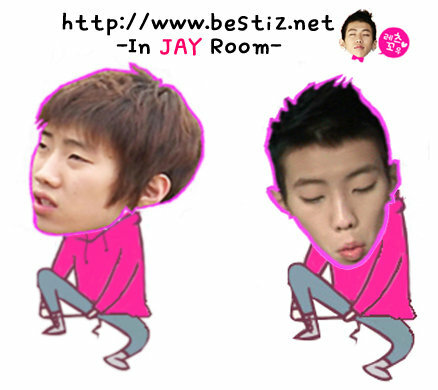 He taught MC Wooyoung some of the basic moves, but for rookie Wooyoung, he lost easily, making the audience fall in laughter. On the show, Jang Hyuk also revealed the story of how he made his chiseled body for his role in Chuno and exposed his 6 packs, fluttering the hearts of the women in the audience. 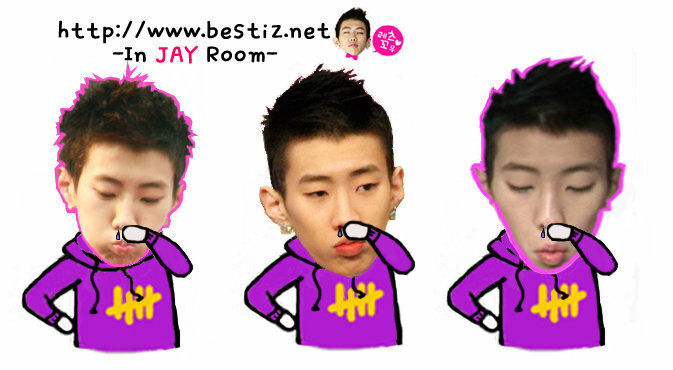 Yes, you’ve read correctly: Jay Park’s making his very first public appearance in New Jersey with allkpop! 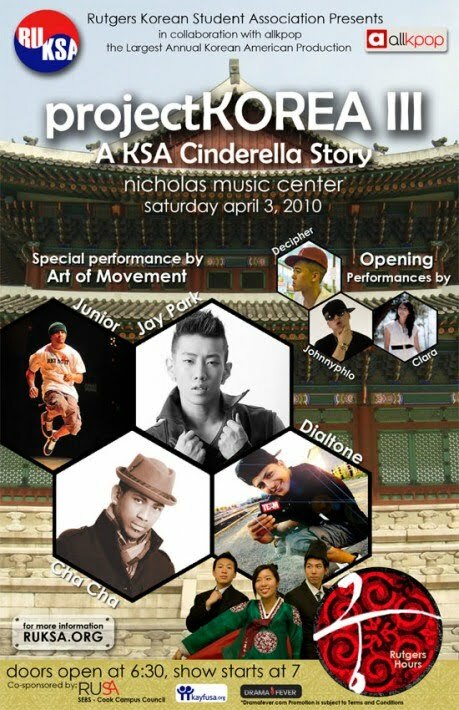 In collaboration with the Korean Students Association of Rutgers University, allkpop brings you Rutgers’ largest annual Korean-American Production, projectKOREA III: A KSA Cinderella Story. The action-packed event will feature opening performances by artists from Muzo Entertainment, including Clara Chung (Kollaboration 10 winner), Johnnyphlo and Decipher and special performances by Art of Movement’s Cha Cha, Dialtone, Junior and – last, but certainly not least - Jay Park. Join the Korean Students Association as we venture through a “different Korea.” Based on the hit Korean drama “궁” (Goong, aka Princess Hours), this timeless musical explores a hypothetical Korea where the royal family still flourishes. You will laugh, cry, and be amazed by all the acting, dancing and singing as we portray this “different Korea”, helping us realize the importance of embracing one’s heritage. The event is already receiving undivided attention from the public as it will mark Jay’s first major public appearance apart from 2PM. The tickets are sure to sell out fast so be sure to purchase yours soon. There has never been such a diversion regarding a national idol group such as 2PM's Park Jaebum controversy. Disputes of nationalism, noise marketing, the tyranny of the company, and the power of the fandom all exploded within two turns. Because of this, the issue has been the topic of TV debates and current affairs. Even so, there is still so much left to say, especially regarding the psychological foundations of Korean idol fandoms. The Park Jaebum controversy is a perfect explanation of such a topic. Last fall, the first part of the Park Jaebum controversy regarding his Myspace comments ended on a rather positive note, with many supporters coming forward. Due to excessive noise marketing, 2PM even received some benefits from it, their name sky rocketing to instant fame. Both Park Jaebum and 2PM received great sympathy from the masses, the first, for being 'banished,' and the second, for losing Park Jaebum. Because of these benefits, they were able to win every award during the year end ceremonies and came out on top as the #1 group. However, the second part that came about after Park Jaebum's complete withdrawal brought about the complete opposite of results. The conference with JYPE, 2PM, and their fans proved that the members of 2PM agreed wholeheartedly to Park Jaebum's withdrawal and Park Jaebum's private life became an unspeakable, severe matter. Despite it all, the arrow turned back at the rest of the members and the fans turned into antis while the fandom cracked. The difference between the first and second part is really only one reason. It all depended on 'which side' the six members stood on. During the first part, they had no clear stance, while in the second part, they stood clearly on the side of JYPE. That one difference was the difference between heaven and hell. Of course, there are many analyzations regarding this matter in columns and articles but the context is alike. Idol fandoms had always stressed the importance of friendship between the members. 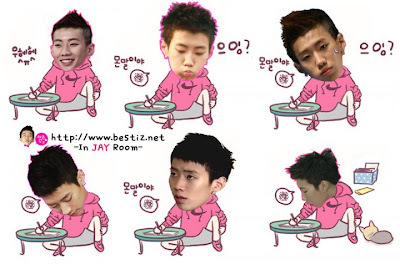 During the first part of the controversy, the members had always stressed their friendship in various award ceremonies. After the second part of the controversy, they no longer do, causing the fandom to turn in the complete opposite direction. Looking at it from an outsider's point of view, what you see is what is exactly happening. However, the explanation does not end there. If the fandom does not receive what they want from the idols, they can just leave. But the diehard fans of 2PM have now turned into diehard antis. Although they released their private lives on internet boards and emailed journalists with them, they were the ones that once strongly loved the boys the most. Their feelings are not just one of disappointment but of detestation. What exactly is the reason that gave birth to such an empire of hate? Omitted lengthy analyzation of old idol groups HOT, GOD, Sechs Kies. But the Park Jaebum controversy requires a new viewpoint. During the first part of his controversy, he was seen as the weaker person (TN: deserving of sympathy) for having been kicked out due to one mistake, sympathy that was received from people that had the same feelings of being pushed around by a brutal society. It was impossible not to feel sympathy for the rest of the 2PM members either. They, too, had lost Park Jaebum and they were also the weaker ones in the battle. This notion is easy to organize and easy to understand. The company is the one that is deserving of hate, but the weaker ones must be protected. As long as they were the weak, they were the idols. The aspect of the second part of the controversy was different. Once viewed as weak, the rest of the six members turned into traiters and are now standing on the side of the strong. 2PM is the group of the strong, a group that caters to the strong, and a group that utilized their position of strength to push down those weaker than them. The fandom has now lost their projections. An idol that does not project them are no longer idols. Love and attachment takes only a moment to disappear. The fact that one loves 2PM, the fact that one love any idols of Korea, means that one also loves 'one's self.' This is not disappointment. This issue is a direct threat to one's self, and this is what brings about anger. This is the level that must be reached in order for the fans to turn into antis, and with that change, they have also gained power. 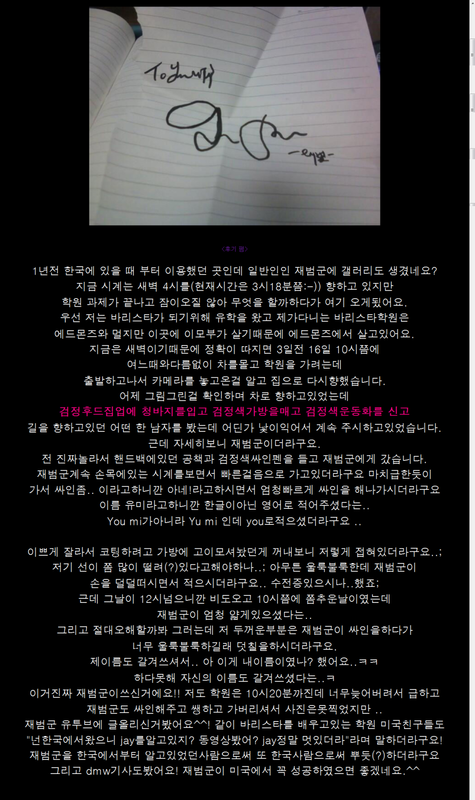 To the fans, 2PM is a presence that must be hated more than the company, a group that has brought them despair. Of course, this is just a temporary event. The terror will soon cease, but the detestation will not, and the love they once had towards them will never be revived. 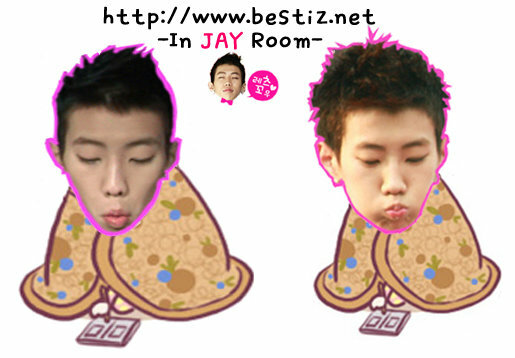 2PM will be thrown away and the fans will soon find a new subject. The weakest of the weak, thrown away twice by the strong, that subject is Park Jaebum. There is not another perfect, more deserving subject than him. With a rumor about a possible American debut already circulating, the big names within the fandom have already moved to his side, with the high possibility of the rest of the fandom following. Conclusively, the Park Jaebum controversy left a lesson to the idol market of Korea. That lesson is to never shake the foundation of Strong-Fandom-Weak, a foundation that the idol market has created itself. The notion of 'The president is our hyung, our father,' and 'We are one family with our company,' is a hopeful stance taken by companies but not particularly what the public requests for. There are no benefits stemming from becoming a 'nice company.' CF deals and singer incomes are based off of the idol's image and popularity, not exactly whether the company's image is positive or not. Celebrities with many rumors surrounding them still manage to land CF deals. The beautiful but weak princess and the brave prince that protects her, along with the dangerous, disgusting dragon. This is a fantasy that has never changed for thousands and thousands of years. Perhaps there are situations where the dragon and the princess spark a deal and take some income from CF deals while screaming nonsense such as 'We are one family,' but in the end, it all comes down to understanding who is selling what, and to whom. Maybe then, the same mistake will not be repeated. 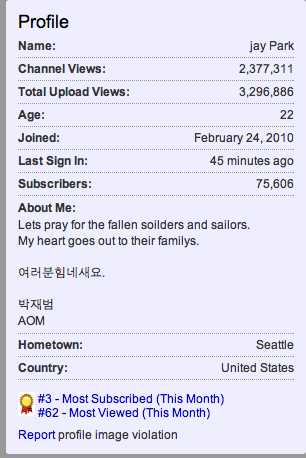 Lets pray for the fallen soilders and sailors. My heart goes out to their familys. Nickhun's first kiss was revealed to be done when he was 17. On the 27th's MBC TV 'We Got Married', Nickhun revealed when he had his first kiss at his visit to JoKwon and Gain's house, when they were questioning(?) him. 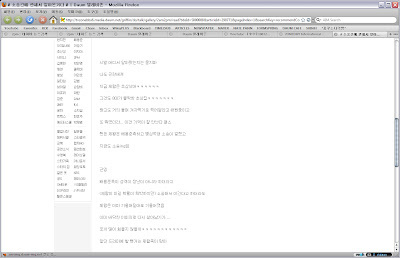 JoKwon asked Nickhun, "Do you like skinship", and Nickhun answered, "Of course". At Nickhun's answer, JoKwon asked again, "How does hyung do skinship", and the flustered Nickhun answered with an awkward smile, "There are basics". Gain then asked teasingly, "Then did you kiss before? Of course you did, right", and Nickhun avoided the answer by saying, "Enjoy the food". At this, JoKwon threatened a threat unlike a threat, "We have a lie detector", and Gain then quickly added, "When did you have your first kiss?" Finally, Nickhun gave in and revealed, "When I was 17". It was revealed by Seo Woo that 2PM member Taecyeon had attended his drama's first script reading practice with his pants' zipper down. On 27th, during the live show of KBS 2TV Live Entertainment Information program 'Entertainment Tonight', Seo Woo revealed this to a reporter who was asking him about an anecdote in the 2TV mini series 'Cinderella's Sister'. Seo Woo said laughing, "It was our first script reading practice. Taecyeon didn't even know his pants' zipper was down, and said hello really loudly." At this, Chun Jung Myung said, "At that time, the people enjoyed that a lot." 'Cinderella's Sister', featuring Moon Geun Young, Seo Woo, Taecyeon, and Chun Jung Myung will be broadcasted for the first time on the 31st.